In 90 hectares land in Ecuador, a small family started their own cocoa business with a cocoa plantation and chocolate production. When they realized that in their land lied the ruins of a historical villa, known as the Castillo (castle in Spanish), they didn’t lose the chance to offer besides their agricultural activities, touristic oriented services. 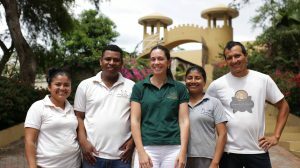 “Hacienda el Castillo” (The Castle Ranch), is the name of this family business located in the Cerecita Valley, west of Guayaquil on the Ecuadorian coast. They look after the whole process of cocoa plantation and chocolate production. They also still use homemade recipes and manual procedures in chocolate making. Today, their visitors can enjoy daily guided tours, and a route in which they will be able to get to know with the entire process of the cocoa crop, from its seed until the final product “Chocolate”. Back to 1930, Ludwig Weber, a German Count arrived to Ecuador and married Maria Angelica Calero, daughter of Evangelista Calero Gaybor. Evangelista born in the little town Yasacoto in the Province of Bollvar. His popular shoe making industry helped him raise a fortune. In 1950’s the Count Weber and his wife built a villa in their land near the town of San Isidoro. This land had 1600 hectares and the villa brought the name “Castillo”. Weber had been deported from the United States to the Crystal City Camp, during the Second World War. Τhe accusations were that he was considered a Nazi spy, because he was a pilot who fought for Germany during the First World War. The beauty and tranquility of Castillo’s location made the German Count Weber to settle there with his wife and enjoy his years of retirement. The Castillo was located in one of the highest hills of the area, favoring its amazing view. Its first floor was made of concrete and it had two other floors made of wood. Weber and his family spent many years of their lives in the Castillo, until his death in 1967. Immediately after, inhabitants of the surrounding area robed the Castillo.They left it in ruins. Over time, the property’s condition worsen. The Count’s family lost its ownership of the land, when Calero lost his fortune. At the end of the 1980’s, new owners bought part of what today is the Hacienda El Castillo. There the ruins of the villa where found. For more than 20 years, this small family business has been based on an agricultural, tourism and industrial operation, contributing to the area’s development. The cocoa at the “Hacienda el Castillo” is the Don Homero – Cerecita. The Don Homero refers to the variety of the cocoa used in the plantation. Cerecita means the region where the Hacienda is located. The Don Homero is of Trinitarian origin, which is why people consider it as a fine and aromatic cocoa. This variety had a development in the 1960’s, during an intense selective program held by the Ecuadorian agronomist scientist Homero Castro. For the chocolate makers, this cocoa has more mass content compared to other varieties, which makes it very attractive. The last years the production of specialty cocoa is getting even more popular from small family businesses. Then commodity trading companies are also taking part in trading these types of specialty cocoa. These market trends make it clear that a new and interesting chapter opens in cocoa trading. 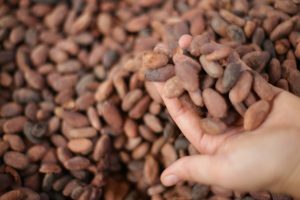 Cocoa trading companies now they should also have flexible options regarding their specific CTRM systems for specialty cocoa.